Highback Winged Armchair, England, circa 1910 Partially upholstered in beautifully patinated indigo dyed fabric with exposed back and sides as well as front ball and claw feet. High back winged armchair, England, circa 1910. Partially upholstered in a beautifully patinated indigo dyed fabric with exposed sides and back, as well as ball and claw front feet. Primitive wooden armchair, England, circa 1820. Unusual high back chair in ash and oak with shaped finials and six straight spindles on a slab seat. Tapestry armchairs, England, circa 1890. 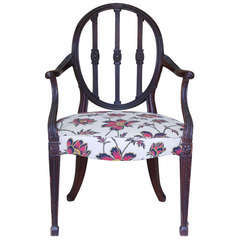 Elegantly carved back and frame with beautiful needlework upholstery. An English George II period wing chair upholstered in tapestry with mahogany legs, circa 1750. 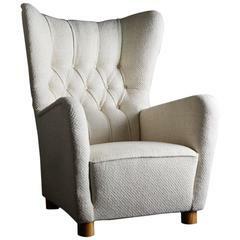 Large wing chair with cylindrical beech feet. Swedish work from the 1940s. Reupholstered. An early 19th century English elm windsor elm or yew armchair on pad feet, circa 1840. 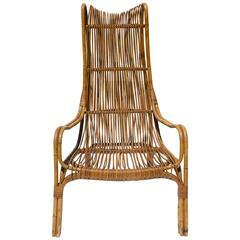 An English oak wavy ladder back Lancashire armchair with a rush seat, circa 1820. Newly upholstered. Oak wooden frame is in good original condition with minor signs of use.